The development of the object-oriented programming significantly facilitated the process of software development. Nevertheless the development of software with good design, reliability, modularity and usability is still problematic. IDEF4 standard was developed for correct usage of object-oriented technologies. Accordingly to IDEF4 standard, the object-oriented process is represented with the help of diagrams, which helps to analyze this process and to discover its key points. The particularity of IDEF4 standard is the representation possibility of the influence of classes’ heredity, objects composition, functional decomposition and polymorphism on the object projecting. The process of object-oriented projecting by IDEF4 method is divided into separate blocks. Each subrun has notations, which indicate which decision should be accepted during the projecting process and how it will influence on other subruns. By IDEF4 standard the common diagram, describing the whole project, is not developed. This allows to avoid confusion and quickly find the necessary information on the project. IDEF4 standard lets the planner easily find compromises between classes’ heredity, objects composition, functional decomposition and polymorphism in the project. 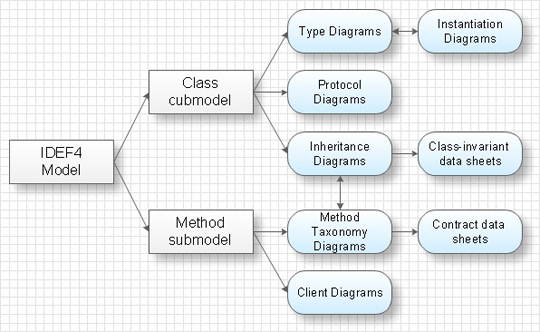 IDEF4 model consists of 2 submodels: model of classes and model of methods. These submodels are connected between each other with the help of a distribution scheme and contain the whole information on the project. Because of classes’ subruns sizes and methods the planner never uses them as a whole, using a set of simpler diagrams and specifications which contain the part of information. Diagrams of objects creation (Instantiation), which describes the process of creation of exemplars of the preset classes’ objects. Diagrams of clients, which represent clients and operations suppliers, so that to define the functional decomposition. The diagram of heredity represents hereditary ties between classes. For example, at the picture below the structure of heredity and Filled Rectangle class behavior is shown. Diagrams of protocols define arguments of classes for protocols call. At the picture below the diagram of a protocol for Fill-closed-object is shown. It is obvious from the diagram that Fill-closed-object gets requests from Polygon object (primary argument) and Color object (secondary argument) and returns the request to Polygon object. Diagrams of objects creation come into diagrams of types and describe possible situations at composition of ties between created objects.. The diagram of methods systematization describes specific type of system behavior at the influence on the set of methods. Arrows on the diagram point at additional influences, done at the sets of methods. The sets of methods are grouped accordingly to additional obligatory conditions. At the example given below the set of methods ‘Print’ has an obligatory condition that the object must be printed and the set of methods ‘Print-Text’ – that the printed object must be a text. Diagrams of clients represent clients and operations suppliers. Double arrows on the diagram point from the called operation to the calling operation. At the example given below a diagram of clients is shown. On this diagram the Redisplay operation which belongs to Redisplayable-object class calls the Erase operation of the Erasable-object class and the Draw operation of the Drawable-object class. IDEF4 standard implies not only graphical presentation but the additional information about diagrams of heredity, methods systematization and types which are contained in specifications. Accordingly to IDEF4 standard there are specifications of invariant classes and specifications of obligatory conditions. Specifications of invariant classes are connected with diagrams of heredity and define influences which form properties of each concrete class of objects. For each class there exists a separate specification. For instance, the properties “Each square has four sides” and “All square sides are equal” are the properties of specification of the Square class. Specifications of obligatory conditions are connected with sets of methods in diagrams of methods systematization and define obligatory conditions, which influence on methods and which methods should satisfy. For each set of methods there is one specification of obligatory conditions. For example the set of methods ‘Pop’, which deletes values from the stack, as obligatory condition will have the absence of attempts to delete the value from the stack if the stack is empty. IDEF 4 standard is developed by professional planners and programmers of the U.S. Air Force Armstrong Laboratory and is intended to facilitate the usage of object-oriented technologies at software development. These flow charts help scientists analysts and other decision makers to visualize the complex interrelationships involved in managing our nation x2019. PRO is a powerful drawing tool that changes the way diagrams are produced. ConceptDraw Arrows10 Technology - This is more than enough versatility to draw any type of diagram with any degree of complexity. Diagrama de Topologia or Topology Diagram helps you see the big picture as you develop a service. Rack Diagrams visualize the rack mounting of computer and network equipment as the drawing of frontal view of the rack with equipment installed. They are used for choosing the equipment or racks to buy, and help to organize equipment on the racks virtually, without the real installation. Network Diagramming Software - ConceptDraw DIAGRAM v12 is perfect for software designers and software developers who need to draw Rack Diagrams.